As I sit in front of my computer on December 14, 2017, realizing that even though there were several false starts over the course of the last several months, I have not broadcast a blog post since early in the spring. I also did a review of the materials surrounding my desk and realize that there is no way to catch up on one post. In fact, there are hundreds of images I have not even filtered for quality or significance. Spring of 2017 Part 1 attempts to begin the process of catching up. With that in mind, I have decided to break down all the travel and photography accomplished over the past several months into what I hope to be bite-sized blog posts. The plan as it currently stands has me producing three posts to cover the spring of 2017 up to and including our first several days in Yellowstone National Park prior to our official start of work as campground volunteer camp hosts. I have made the breaks in geographical logical places thereby making each article cover a region of the country we traveled through. This strategy could be good news for all. For you, my readers, you won’t have to wade through thousands of words and who knows how many images at one sitting. I won’t have to stress over covering six or seven months at a time. For my website analytics, there should be a smoother curve showing visitation which could help me over the long-haul to attract more attention to my blog and website. Connie and I started our trek to Yellowstone a little later this year than in recent years, leaving home on May 16. We were quite fortunate in that there were no last-minute surprises as had plagued us for the previous two spring departures. I had taken the motorhome to the chassis dealer well in advance and had all the required periodic maintenance performed as well as some corrective maintenance on the dash air conditioning system. So, we were confident that the coach was in proper working order. Additionally, I had done a pre-departure date test hook-up of the car to make sure all the cabling between the coach and car was intact, so we wouldn’t spend hours on that first day trying to get the lights on the car to function. I do not understand why that simple system is so finicky, but it certainly has given us some grief over the years. Of course, when I hooked the car up at the storage area, there were no problems. I would like to say that gave me hope there would be no problems on the day that counted, but with our past experiences, I could not be completely sure. As it turned out there were no delays due to lights not working when we hooked up for real. The first few days of our journey this year, as in most recent years, just had us getting out of Texas. That isn’t because there are not things to see and do along our route, it is just that we have been there and done that many times before. There are places we would like to spend more time exploring along that route, but the best times to do so do not correspond to the times we are traveling through on our way to Wyoming. 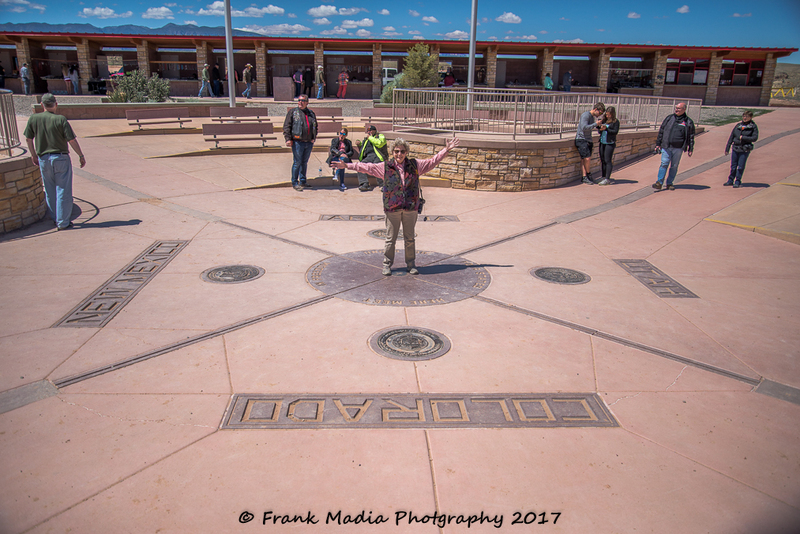 Our first intermediate destination this year was to be the Four Corners area of New Mexico, Arizona, Utah and Colorado. 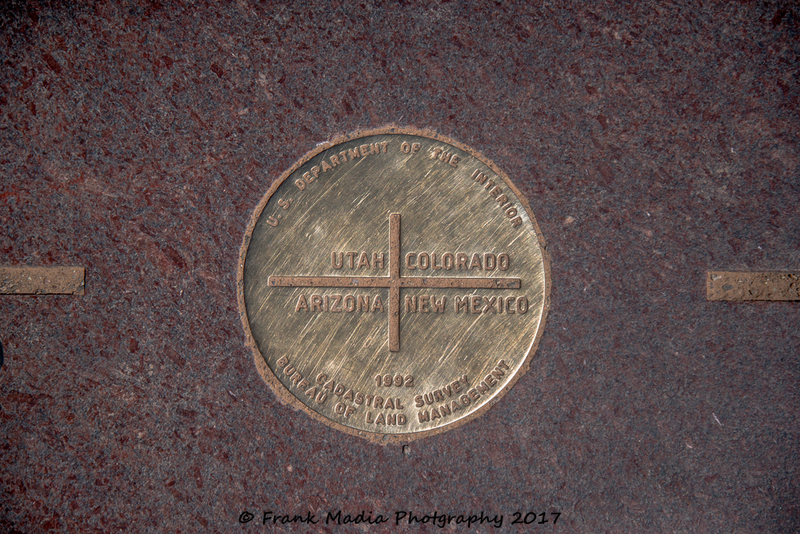 We had heard many stories about how the specific location of the geological marker identifying the exact location where all four states touch one another is a tourist trap. We also knew we would see it anyway. Four Corners is located on the Navajo Reservation. The Four Corners Monument was constructed and maintained by the Navajo Parks and Recreation Department. The mission statement for that organization says, “The Mission of the Navajo Parks and Recreation Department is to protect, preserve and manage tribal parks, monuments and recreation areas for the perpetual enjoyment and benefit of the Navajo Nation – the spectacular landscapes, buttes, canyons, clean air, diversity of the plants and wildlife, and areas of beauty and solitude. “ As is the case with state and national parks, the Navajo Parks and Recreation Department depends on entrance fees and donations to fulfill its mission to protect and preserve the special areas within the department’s responsibility. I found the nominal fee required for entry to the Four Corners Monument not only necessary but also very reasonable. It probably goes without saying that I did not find the monument to be a tourist trap. 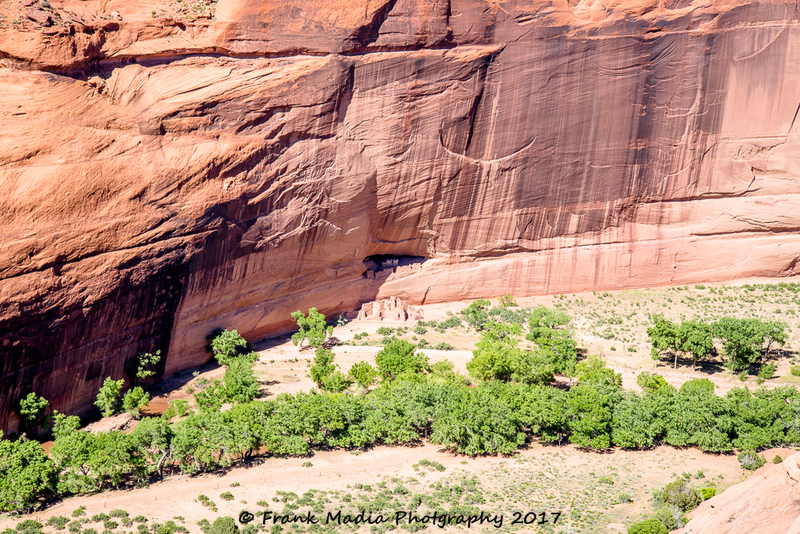 As you can see by the images I have included below, the Navajo Nation has done a wonderful job in highlighting this unique location. I would be remiss to not point out that the Navajo Nation is, in fact, a sovereign nation within the boundary of these United States. As such, we have an obligation to respect the laws and customs of this nation the same as we expect visitors to the United States to respect our laws and customs. 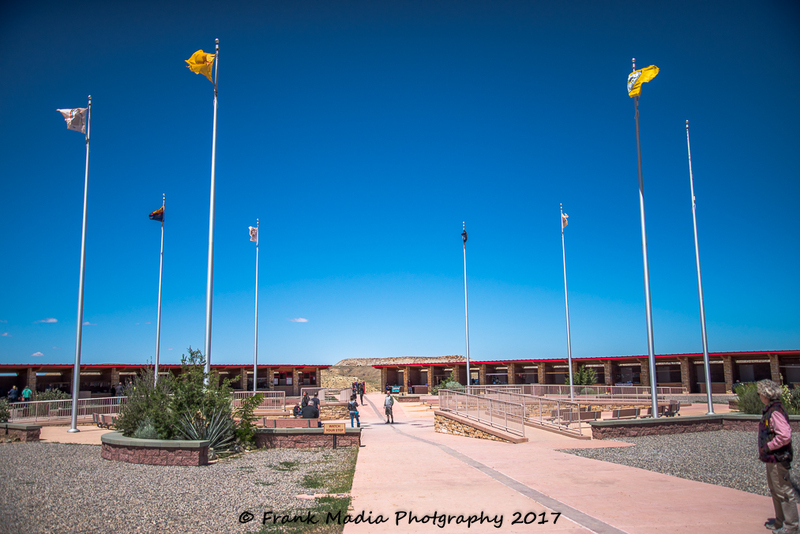 As you enter the monument you can see the flags of the four states that form the corners as well as Navajo Nation flags. We were fortunate to visit on a bright sunny day. The day was a little chilly and the wind certainly reminded us that it was still very early in the spring. Here you can see the four states that make up the Four Corners region. Connie is standing over the survey marker signifying the exact spot where all four states touch. Here is the survey marker. The entrance road to the monument makes one wonder if a wrong turn may have been made. Hang in there, you will get there. The parking area needs a lot of work. It was obvious to us there had been a lot of rain recently causing the parking area to turn into a mud pit. We were able to find dry parking and as importantly a dry walk to the monument. There are several picnic tables around the outer perimeter of the monument. On a good day, this would be a wonderful place for a lunch or just a peaceful resting place. The inside perimeter of the monument is lined with Navajo craftspeople selling their wares. Unfortunately, there were none we were interested in purchasing. Others may find that special something to remember the area by. So, if you visit Four Corners be sure to check out what is for sale. 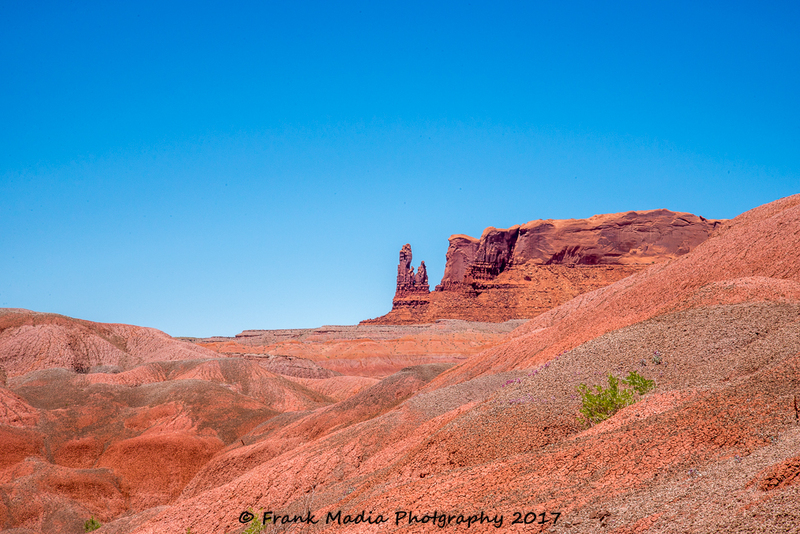 The vast area of the reservation near the Four Corners offers some great sightseeing opportunities. Connie and I spent the entire day driving countless roads taking in the scenery. I made a lot of photographs, but to be honest those that remain in my personal memory were for the most part much better than those the ended up on the SD card. I have included a few of my favorite images below. 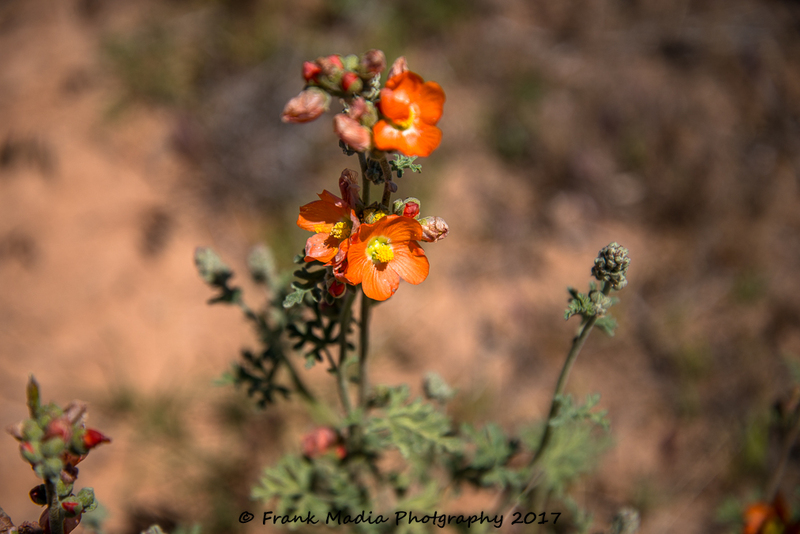 As we drove along, I kept seeing these pretty little reddish-orange flowers along the right of way. I finally stopped for some photos. The wind made for a challenge, but I was able to get a few clear images. This is a Scarlet Globemallow. 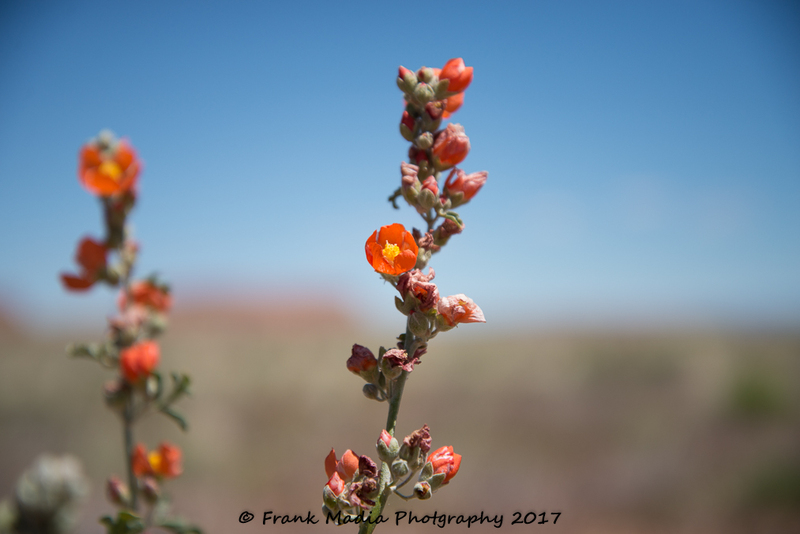 Ancestral Puebloans were apparently familiar with Scarlet Globemallow since its remains have been found in archeological sites at Mesa Verde. The plant has been used medicinally by Native Americans to treat snakebites, bleeding and skin problems. The Navajos used it to treat stomach problems, coughs, and colds and used the leaves as a tobacco substitute. Hopis found the roots therapeutic for gastrointestinal problems and broken bones. I found them to just be a welcome splash of color lining an otherwise dull roadway. One of the many stunning views. 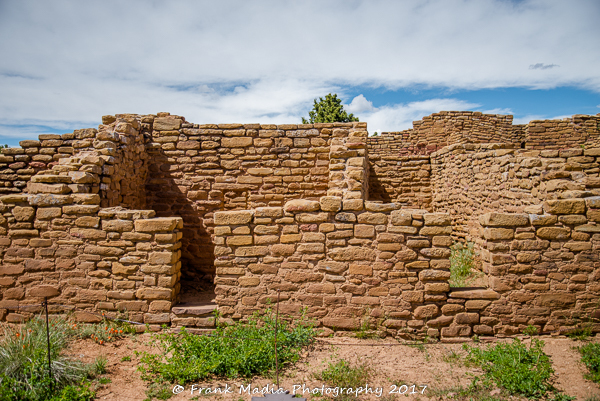 The next stop on our adventure was Mesa Verde National Park in Southwest Colorado. We made an amateur mistake regarding this visit. We looked at the map and noting the size of the park, we decided that this was easily a park that could be done as a day trip including the drive time to and from Farmington, New Mexico where we had established a temporary travel hub. We realized our mistake shortly after entering the visitor center near the entrance to the park. First and foremost, the National Park Service has done a marvelous job of preserving these ancient villages and cliff dwellings. Were it not for the fact that this land was set aside to be preserved and protected a valuable piece of the prehistoric history of this country would very likely have been lost to development or mineral extraction. The main road into the park is about 30 miles long with a 12-mile spur that goes to the southwest for access more archeological sites. So, on the surface, it doesn’t seem like it would take too long at all to see what can be seen from the road. Of course, there are always the trails to take into consideration. We had decided ahead of time this visit would not include any long hikes. Our initial stop at the visitor center lasted a good bit longer than we expected as we got a primer on the park along with some advice on how to best spend a short amount of time. Our eventual plan was to drive to the Chapin Mesa Archeological Museum near the southern boundary of the park and have lunch before working our way back to the entrance by stopping at as many of the features as time would allow. The downside to this plan was that we had arrived too late in the morning to give ourselves half a chance to really absorb the historical significance of the area. A little history lesson. 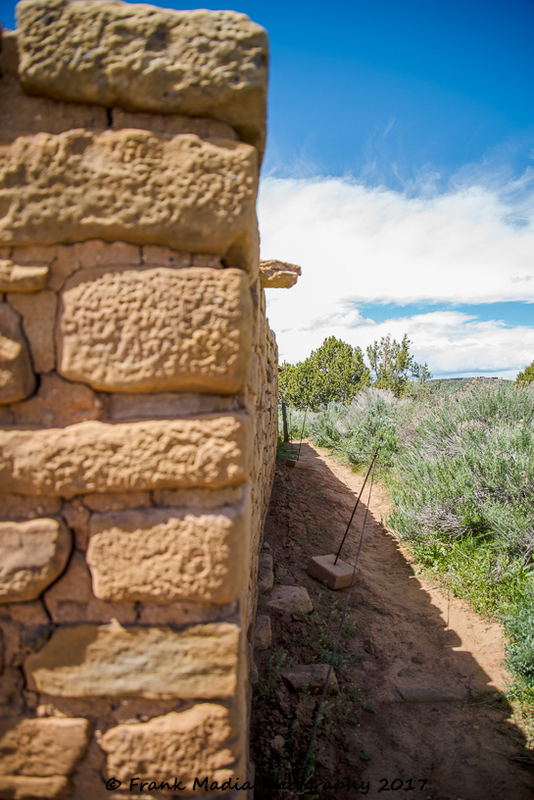 The park was established in 1906 to preserve the archeological heritage of the Ancestral Pueblo people, both atop the mesas and in the cliff dwellings below. 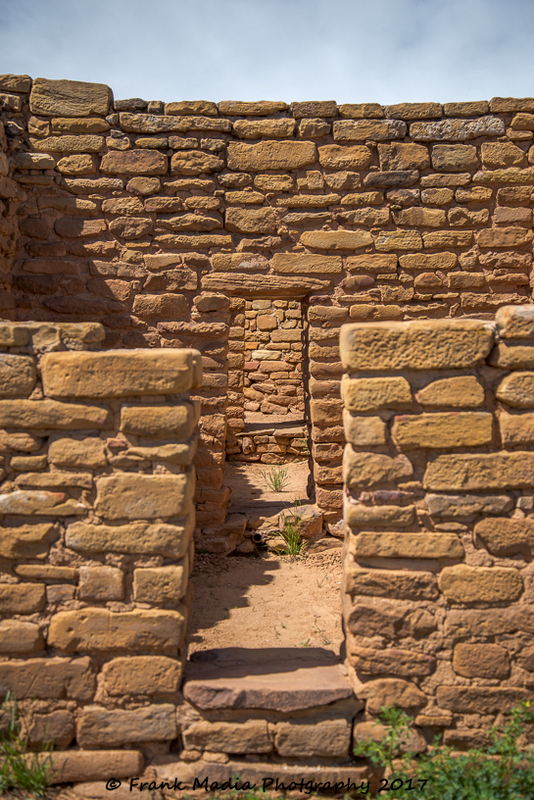 There are over 4,500 archeological sites including 600 cliff dwellings. The Ancestral Pueblo people who lived and worked this part of the Four Corners region came to the area long before any Europeans explored North America. They arrived here in about 550 AD and for over 700 years these people and their descendants lived and flourished here. The early inhabitants of the area lived in so-called pit houses which were relatively simple structures. A pit was dug into the ground and featured four corner timbers that supported the roof. There was a firepit with an air deflector to help air circulate through the room. By about 1000 AD the pit houses gave way to more complex stone structures built on the mesa tops. Sandstone rocks formed into rectangular blocks about the size of a loaf of bread. These structures could be as high as three stories and were joined as units of 50 rooms or more. 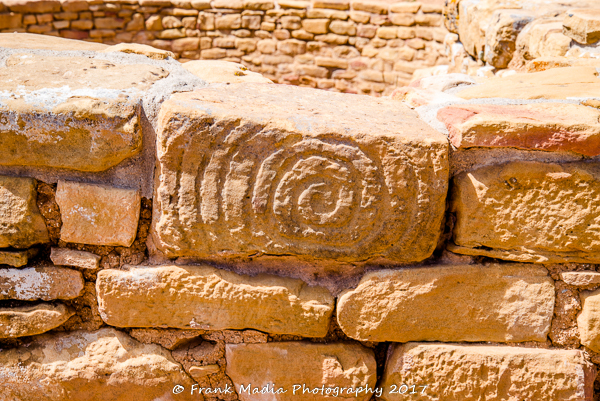 Between 1150 and 1350 which is known as the Classic Pueblo Period, thousands of people lived in Mesa Verde. Many lived in compact villages of several rooms. About 1225, a major population shift saw people moving into the cliff alcoves. 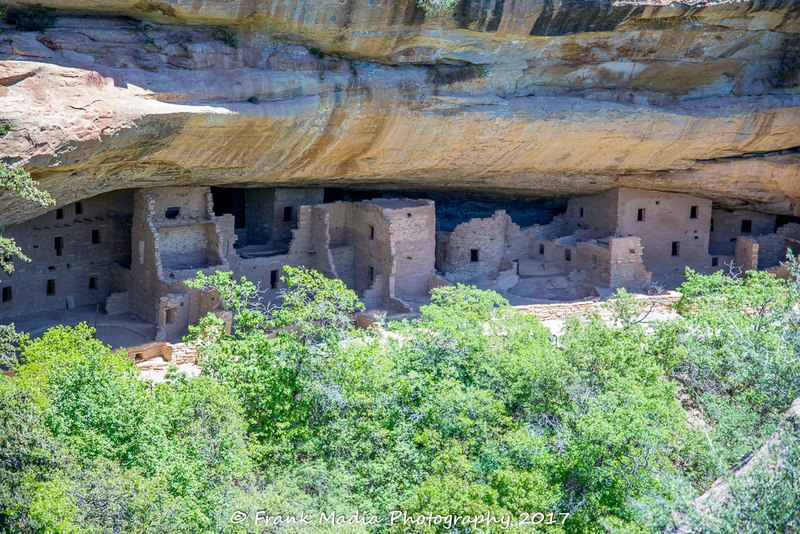 Most of the cliff dwellings were built from the late 1190s to late 1270s. They range from one-room houses to community centers of about 150 rooms. Ancestral Pueblo people lived in the cliff dwellings for less than 100 years. As there is no written record from this period it cannot be determined with any confidence why Mesa Verde was deserted. It is assumed that the people who left moved south into today’s New Mexico and Arizona, settling among their kin or establishing new communities. Today the Hopi of northern Arizona and the people of Zuni, Laguna, Acoma, and the pueblos along the Rio Grande trace their ancestry to the Ancestral Pueblo people of this area. We essentially had a half day to do what the park service recommends be done in a full day. Our half-day was further truncated by the fact that we had several miles of driving to get back to the RV park in Farmington. That was a drive I did not want to make in the dark due to the abundance of wildlife we had seen along the way. With that said, we did see enough of the park and take in enough of a couple of interpretive talks to get a pretty good feel for what is being preserved here. It was a day to be remembered for sure. We also know it has to return to the bucket list with a commitment to spend much more time here. We had very little time to make meaningful photographs and the lighting was not in our favor given the time of day. I have included a few images here to give some idea of how this ancient civilization lived. 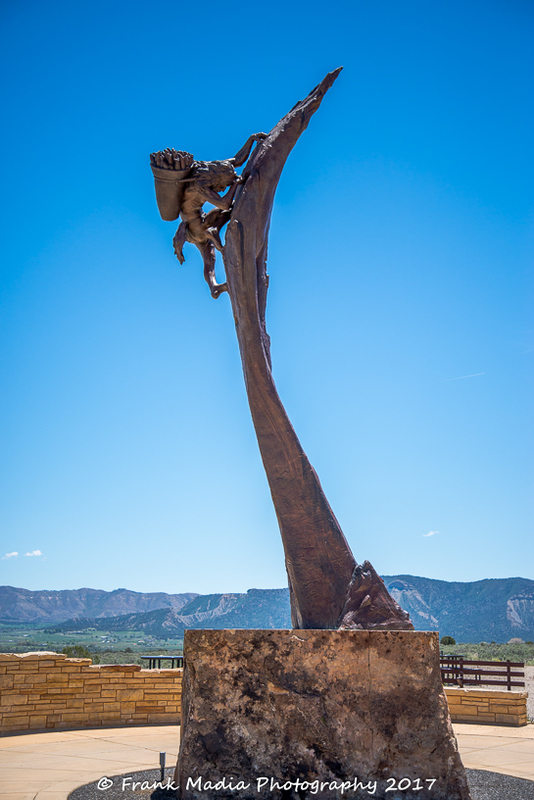 This statue stands outside the visitor center near the park entrance. 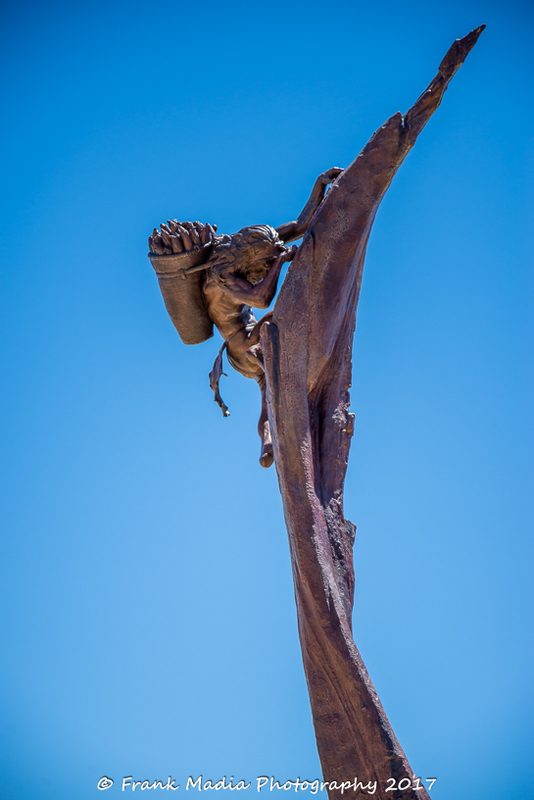 It depicts an Ancestral Puebloan climbing up a cliff with a basket full of harvested crops on his back. I went in for a tighter shot of the man. The next few images were made in the Far View community. This image highlights the architectural and construction skills of the time. This wider view provides a better perspective of the size of some of the structures. This is a Kiva. 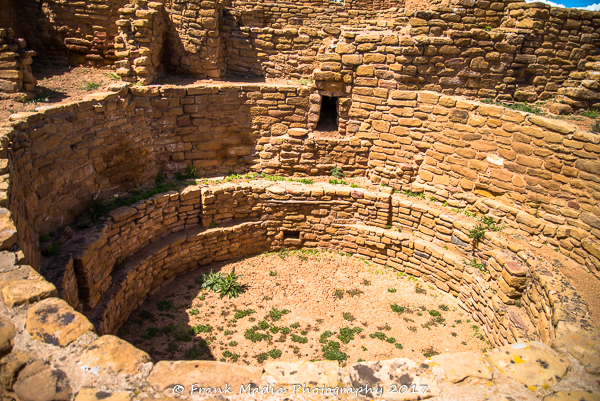 Kiva comes from the Hopi language and is used in Mesa Verde to refer to round chambers, usually underground, built in or near almost every village or homesite. Most have similar features and were likely used for combined religious, social and utilitarian purposes. Entry was by ladder through a hole in the center of the roof. Another Kiva from a different angle. The bench like structure in the lower center of the image is an air deflector. The spaces between the bump-outs along the inside wall were banquettes where items were stored. The bump outs referred to above are called pilasters. This image illustrates the precision that went into the construction of these remarkable structures. Petroglyph on Pipe House in Far View Village. Of all the ancient structures in the area, this seems to be the only one where any sort of inscription either remains intact or was ever present. Some mystery as to what it might mean and why it is where it is, on what appears to be the back wall of Pipe House. As promised, this has been much shorter than many of my former posts. I hope you found it interesting. If you liked it, please share it with your friends and family who may share an interest in the places Connie and I travel to. We will remain in Colorado for the next stop on our trek to Yellowstone. 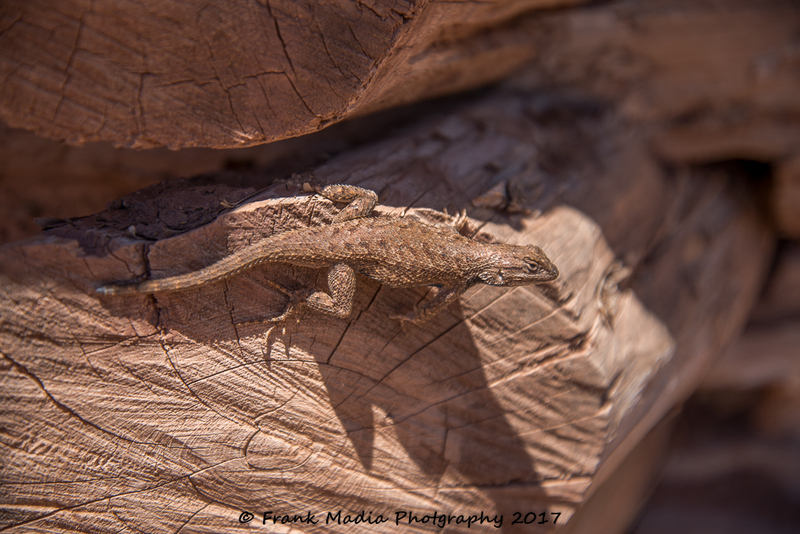 We returned to Dinosaur National Monument in Colorado and Utah. More, more. I enjoy your blog. We LOVE Mesa Verde! These photos are another VISIT! Karen, I think you are correct on both. 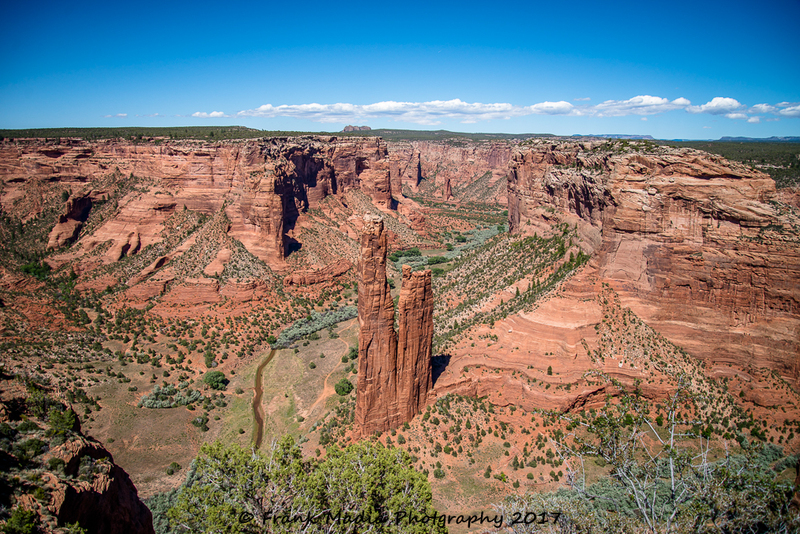 After posting I got to looking at Canyon de Chelly and pretty well convinced myself that was where those ruins were. Love the website! Has me itching to visit the Southwest. I’m busy with preparations for family arriving for the holidays so I haven’t read the blog in its entirety but have flagged it to read when I have a quiet moment. Sort of like putting a favorite book on top of the pile of “to read” books. Took a break from organizing my house and your blog was my reward. I am so used to viewing cell phone pictures. I forgot how amazing professional photos are. Thanks for including such interesting history. You and Connie sure get the most out of life! Thanks, Frank. Wonderful pictures. Ron and I did some camping and hiking on Mesa Verde some years ago. These photos brought back pleasant memories. A moment`s relief from today`s cold! 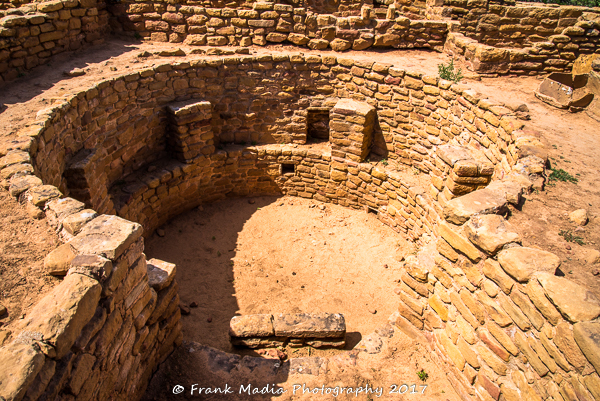 I had always wanted to visit Mesa Verde–now I have a taste of it! Thank You!